A bond is an instrument that provides a financial guarantee of funds for monetary relief in the event a loss. Bonds are often required to obtain a license issued by a governmental authority. They function as a guarantee that the individual or entity holding the license, the licensee, will comply with an underlying law or regulation. 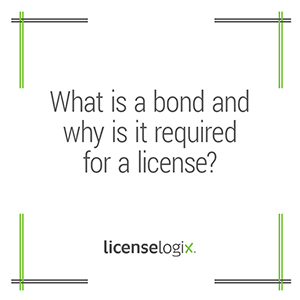 If the licensee does not keep this promise, the licensing authority can use the bond as a penalty or to relieve any damages that may arise. Insurance and surety companies act as the guarantor and issue bonds. The licensee makes an agreement with the guarantor to issue the bond to cover the licensee’s actions. If the licensee fails to uphold their obligation to the licensing authority, the guarantor will provide the funds in the bond to cover any resulting damages or losses. For this service, the licensee pays the guarantor a fee, usually annually, which is based on the amount of the bond and the licensee’s credit history. Many different types of licenses require bonds including collection agency licenses, contractor licenses, appraisal management company licenses and money services licenses. Sometimes the bond amount is prescribed by statute and is the same for each applicant, and sometimes it is based on the gross annual income of the application or some other factor. The government requires bonds for licensure as a way to protect consumers and entice businesses to comply with all applicable rules and regulations. LicenseLogix will help you obtain any bonds required for licenses and registrations for your business, minimizing time-consuming and costly delays. If you are already licensed, we can manage bond renewals and ongoing license compliance. For additional help you can fill in the form on the right or give us a call at (800) 292-0909.